Justin Gaethje dominates his UFC debut! Justin “The Highlight” Gaethje wins his first fight in his UFC debut. The fireworks were saved for the main event of TUF 25! Justin Gaethje (18-0) squared off with Blackzillian fighter Michael Johnson (17-12) in the lightweight bout at the Las Vegas T-Mobile Arena. Justin rocked Michael Johnson with huge haymakers scoring a TKO in the final seconds of the 2nd round. Both fighters totaled 195 strikes in less than 2 rounds of competition. Gaethje hasn’t even sniffed a defeat in nearly 6 years. Justin’s winning streak is the third longest among UFC fighters. Justin has already called out his next fight, asking for Tony Ferguson in an interview with Fox Sports. No matter what system or platform you Stan for you’ve gotta admit that 2017 so far has been loaded with releases for exciting games. It’s still early in the year and we’ve already received new systems and games such as Resident Evil 7: Biohazard, Mass Effect: Andromeda, Tom Clancy’s: Wildlands, and Injustice 2! All those titles have done extremely great numbers wise, and have been met with a warm response from gamers. It’s still early in the year and there’s so much more to come. The Xbox Scorpio and PlayStation Neo are sure to put the pressure on developers to up their game to bring consumers true 4K gaming. Me, myself I’m looking forward to this year’s installment of Call Of Duty: WWII, Red Dead Redemption 2 and God Of War: A New Beginning. Those titles have an illustrious history of being great classics that fans will never forget! Comment below on what titles you’re looking forward to this year. My all day vape is Unicorn Blood by far! My taste buds are very particular when it comes to vaping. Vaping is very objective when it comes to taste. Everyone’s taste buds are completely different, for example I hate chocolates, tobaccos, and floral vapes. Can’t stand them, but some people absolutely love them! I’m more of a fruity vape kinda guy which is why I fell in love with Unicorn Blood when I first tried it back in 2012. Unicorn Blood brings me back to my childhood when I would just throw a bunch of Skittles in my mouth at once. Fuzion really hit the nail on the head when they made this one and for those who aren’t crazy about the colored juices it even comes in a colorless option. So we want to hear from the Fuzionheadz, comment below what’s your ADV and why? Hey Fuzionheadz! Were pleased to announce that Fuzion Vapor and D'Nish have partnered together to tackle the whole United States. Stay updated by following our social media outlets to watch for route updates and events that we will be visiting. Look out for the "Cherriot" in a city near you! I started vaping in 2012, ever since then I've been trying to find my ADV. You know, that flavor that isn't too sweet, too tart, or just plain bland. The day I stepped into Fuzion Vapor I found just that! It was love at first draw! Krankberry instantly takes you back to your childhood. You know? Walking to the local candy shop and buying that raspberry taffy or going to the gas station and filling up your ICEE with the blue raspberry. Well, thats Krankberry in a bottle! 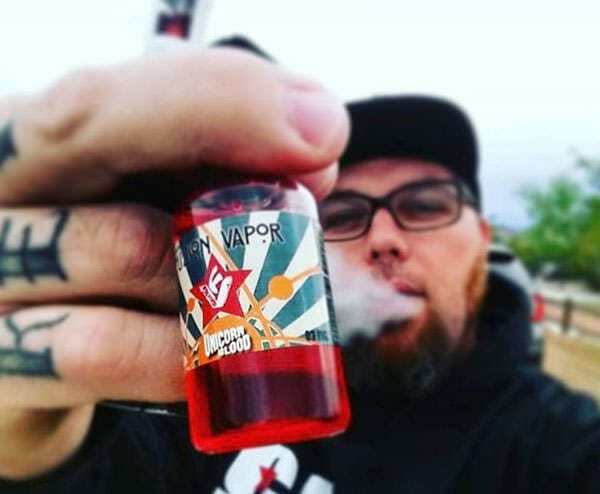 Anybody who calls themselves a vapor; Krankberry is a MUST-TRY! Justin "The Highlight" Gaethje moves to 17-0 after his December 31st bout at the great Madison Square Garden in New York City. This fight against Luis Firmino turned out to be a complete brawl with both fighters trading devastating blows. Every time Firmino would close in, he paid a price with Gaethje's demoralizing uppercut. Ending one of the rounds Justin hit Firmino with a now meme worthy front-flip kick that landed straight to the face of Firmino. Towards the end Luiz Firmino looked unrecognizable from trading shots with the champ. The fight ended with the doctor stepping in due to the closure of Firmino's left eye. The fight was full of excitement and will go down as one for the ages.